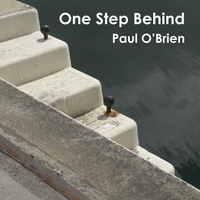 "One Step Behind" is collection of 15 songs and one instrumental piece by Paul O'Brien with tales from Dublin's Docklands and beyond. The tracks have been sequenced in LP style, that is the listener is treated to an "A" side where the song "Fairview" and the instrumental piece "Fairview (Instrumental)" act as bookends to a number of songs with dockland themes, the following 8 tracks look beyond the docks in their subject matter. Fairview; is about the park I spent so many hours in as a child and a place of fond memories, a large green oasis at the edge of the area I grew up in, East Wall. One Step Behind; featured in a Dutch National Television documentary about Glasnevin graveyard, "Gewijde Grond" and is in loving memory of those who once walked with me along the Quays and who are no more. The Ballad Of the Bell; is a tale about the Bindon Blood Stoney's invention, the Diving Bell that was used to construct the harbour walls in Dublin. The Shovels Number Nine; a song for all the Dockers' whose stories may be fading. A number nine shovel was a large shovel used to unload coal. Thank You; for those who were "given their notice" or paid off after years of service while their employers move on to bigger an d better things, as were many Dockland employees in the late seventies and the eighties. Govan Town; a song to celebrate all those Scots migrant workers who came to live and work in the are at the turn of the 20th century. Valentine; another song for the Dutch National Television documentary, "Gewijde Grond" about the mysterious French lady who places flowers on the grave of Michael Collins every Valentine's Day. Arrivals; for many year the first questions an emigrant was asked when back in home was "how is it going?" followed by "when are you going back?". Selection Box; one of my favorite thing about Christmas! Brown Envelopes; about the wheeling and dealing that went on during the Celtic Tiger years. Christopher Columbus in Galway; finally, the true story of Christophers visit to Galway. The Back Road; we were terrified as children by tales of a headless horseman that roamed around Johnny Cullen's Hill at night. Ode to the Black Album; this is how I experienced Planxty's wonderful "Black Album", my first real exposure to folk beyond the Clancy Brothers. Any Old Rags; growing up I was always fascinated by the rag and bone man and his horse. The Night to Remember (That Everyone Forgot); A true story about the home brew days that many have forgotten....strong stuff!